NAMM 2019: Cort has launched more than 30 new guitars at this year’s NAMM show. The company tells us “the collection focuses on spec and attention to detail whilst still offering great value to the customer’. Here’s our pick of electrics from the new releases. New to the G Series is the G290FAT. Headline features of this new line are the boutique styling, expanded tonal options and higher grade hardware and materials, including a Swamp Ash body. On that body you’ll find a 5-way switch for two humbuckers, which expands the breadth of tonal options from thick and meaty humbucker to glassy and sparkling single-coil. The FAT is available in two finishes – Antique Violin Burst and Bright Blue Burst. 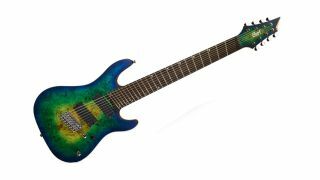 2019 marks the arrival of Cort’s first ever multi-scale 8-string guitar, featuring the popular Fishman Fluence pickups and a lustrous Mariana Blue Burst finish. The guitar features a Poplar Burl top on a Swamp Ash body, ready to deliver plenty of high-mids. The extended scale length means that the low end should stay tight and punchy, too. If you prefer an instrument with more of a vintage vibe, the G260CS positions a nickel-covered humbucker at the bridge, while vintage machine heads and a roasted maple neck complete the look. Aside from the old school style, this guitar should produce an epic, warm sound that conjures images of 60s and 70s classic rock. The G260CS is available in Olympic White, 3 Tone Sunburst and Black finishes. Head on over to Cort for more information.